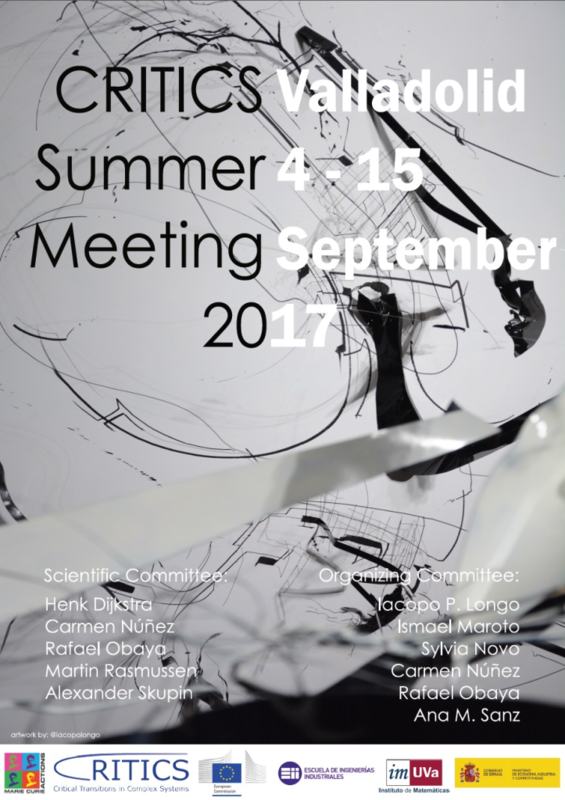 The 2017 CRITICS Summer meeting will be held in Valladolid, Spain, 4-15 September 2017. Recent results by mathematicians and scientists working in different fields of applications suggest the existence of generic early-warning signals that could indicate for a large class of systems if a tipping point is being approached. The focus of this workshop will be on extensions of the bifurcation theory for nonlinear systems to nonautonomous (deterministic or random) dynamical systems. Our workshop aims to capture the very recent developments in this rapidly developing field and to bring together some of the leading applied scientists and mathematicians currently starting to shape a theory for critical transitions in complex systems, with the aim to exchange ideas, promote inter-disciplinary research and develop international collaborations. The organizing and the scientific committees invite you to join and enjoy the picturesque capital of Castile and León, Valladolid, in the early days of September, sure that such a visit will provide a unique framework for meeting interesting people and a scientifically productive involvement. All the information about the meeting, including the program, abstracts of the courses and of the scientific talks, accommodation, internet access and more, can be found in the booklet available here. Participants will be given a printed copy at the registration desk. Jeroen Lamb (Imperial College London). Valerio Lucarini (University of Reading). Chaos: why, where and how much. Carles Simó (Universitat de Barcelona). Alexander Skupin (University of Luxembourg). More information about the doctoral school can be found here. The workshop will also include a posters session. A temptative schedule for the workshop can be found here. The list of abstracts will be soon online. This meeting is part of the activities of the doctoral training network CRITICS: a world-leading European research consortium made up of eight European partners. It provides a unique multidisciplinary training environment for fifteen postgraduates for project work lasting for 36 months. You can find more information at http://www.criticsitn.eu on the CRITICS network.